Section 46 of the Copyright Law of Japan does not allow reproduction of an artistic work exclusively for the purpose of selling its copies and sale of such copies so that photographies of modern artistic works are not considered as "free works" on Wikimedia Commons. Please do not upload photographs showing artistic works, unless they are old enough to be in the Public Domain. See also Freedom of Panorama. Media for the 1954 Japanese film Godzilla (ゴジラ Gojira), released in 1956 in the United States as Godzilla, King of the Monsters! 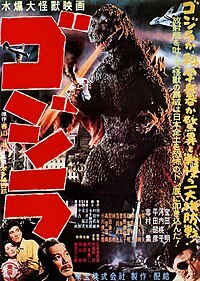 Media in category "Godzilla (1954 film)"
This page was last edited on 22 May 2018, at 23:43.